When you enter the restaurant, you will immediately feel amazed of the setting. The seats are set in a way that everyone will face the same direction towards the “Noh stage.” Farthest away seats from the stage imitate the sides of symbolic bridges of Kyoto. Miso soup is the main character of this restaurant. Inside the restaurant, you will see wooden plaques lined up on the wall listing the choice of ingredients you can choose for you miso soup as if you are picking the one you want to have appearance. 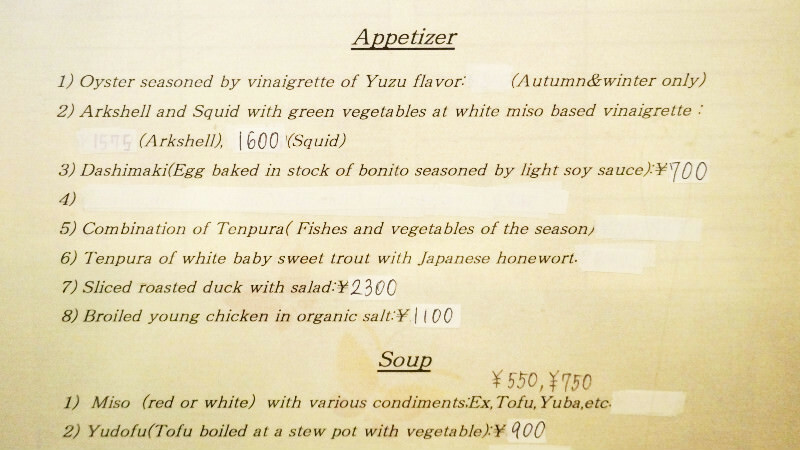 With touch of unusualness, this restaurant will make your Kyoto trip memorable. This meal is very “Kyoto-like” with sides that portray the quality of ingredients. In the center is seasoned rice surrounded by vegetables, boiled egg, fish, chicken, and pickles all seasoned perfectly. Bento comes with their famous miso soup which you can choose from white miso, red miso, or clear. The miso soup that comes with bento is with tofu. You can replace tofu with other ingredients for additional price. The miso soup in Shirukou is full-bodied, thick, and simply presented. You can choose one out of ten different lists of ingredients to put in your Miso soup. The list of ingredients may change according to season and the prices vary so please ask the staff for more details. One of the most popular ingredients to put in miso soup is “Otoshi Imo” which is grated yam. Slimy-texture goes well with miso making the soup tastefully mellow. Not overpowering, this eel rice bowl is easy to eat. You may picture rice bowls to be full of dark sauce, but the dish that comes out is not like the one you may expect. Very much Kyoto-like, this eel rice bowl is simply light and fluffy. Add some graded green Sansho Pepper according to taste. There is a stand with information about take-outs written in Japanese on the table. It lists popular souvenirs of Kyoto such as Chirimen Sansho which are dried whitebait fish with Sansho Peppers. Also you can buy packaged miso paste with side of ingredients to re-create the bowl of miso soup you enjoyed in this restaurant. However, keep in mind that although they are neatly packaged, refrigeration is needed. Also you can take out most of their menu items like the Rikyu Bento (without miso soup) and Eel Donburi. Don’t expect the experience to be normal. The restaurant is unique, and may have unfamiliar items on the menu. Do ask for more details if you feeling unsure. Shiruko is really famous for their great miso soup. Their classic is white miso soup with tofu, but you can choose the type of the miso and ingredients which is fun. Inside the restaurant you can eat Japanese miso soup while you enjoy a quintessentially Kyoto-like atmosphere. ・2-minute walk from Hankyu Kawaramachi Stn. ・5-minute walk from Keihan Line Gionshijo Stn. Ask for an English menu if needed. We recommend asking the staff for more information about the menu since there may be seasonal items available like “Zouni” which is soup with Mochi especially eaten around New Year. English menu is available, however you may need to ask for details.